The more I use this, the less I want it. Having a GTX 960 covers my PCI 1x slot, which I would have liked to use for a wireless adapter. I've had problems getting some of the rear I/O to work. But you get what you pay for. Definitely find something that is more reliable. This motherboard came bundled with the processor. It's not the best, since it only has 2 fan headers (1 for CPU and 1 for chassis) and uses SATA 2 instead of SATA 3. It has a dark brown PCB but since this build doesn't have a window it doesn't matter much. Other than that the quality is great. 4 DIMM slots on a mATX board is a nice feature, it has that "Ultra Durable" Gigabyte branding, and I have no complaints on the IO. Great solid board for lean OC. Barebones and only SATA 2 really makes it outdated. Great that they updated the color scheme to black and grey. Installation was fine, installing stuff into it was fine, and it went into the case OK. Nothing special, but definitely nothing wrong. It's a decent mobo that's only worth as much as you pay for it and isn't the best for an OC. Would still recommend to anyone else like me stuck building on a budget. 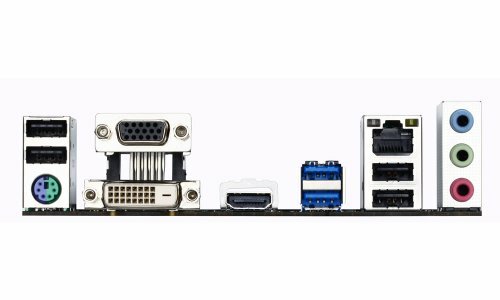 An alright motherboard in general. Haven't tried overclocking on it, so I can't add anything about that. Only has 2 fan mounts (1 for the CPU and 1 for an additional fan) which isn't good. I got this as an emergency replacement after my old one died on me and it does what it's supposed to do. Good for general tasks; not so great for more intensive purposes.